See below for the aftermath of another crash at Vanderbilt Avenue and Dean Street. When I wrote about this phenomenon in February, police said that each of the crashes was caused by an identifiable factor, such as driver error. Residents think otherwise, that the 16-foot green wall that extends into Vanderbilt Avenue to protect residents from construction noise has not only caused significant traffic jams but also continues to pose hazards. A front-page New York Times article, headlined Donald Trump Soured on a Deal, and Hong Kong Partners Became Litigants (and in print as "Soured Deal With Hong Kong Allies Is Tale of Trump’s Extremes"), has a couple of passages with interesting parallels--or potential parallels--to Forest City Ratner's deal with Greenland USA to buy 70% of the Atlantic Yards (now Pacific Park) site, minus the B2 modular tower and the Barclays Center. In need of cash, he agreed to meet with intermediaries from a consortium of Hong Kong billionaires who were willing to buy the land, assume Mr. Trump’s debts and pay him 30 percent of the profits, as well as fees for helping to manage the development of the site, which they agreed to finance. It was by far the best offer he received. This wasn't quite a full 70/30 deal, it seems because Trump wasn't responsible for paying 30% of the costs going forward. But the numbers are notable. So Pacific Park naming is because Pacific Street goes "all the way down to the water"? The other day I was walking on Hicks Street in Cobble Hill where I spotted a sign for the nonexistent Pacific Street (see photo at right). At that point, it's a pedestrian path from Henry Street to the east (at left in photo), and does not continue to the west through green space and the Brooklyn Queens Expressway (see map below). “They’re typically building high-end condos, build it and sell it. Capital return is in a few years. That’s something that is ingrained in the companies that have been coming here because that’s how they’ve grown in the last 35 years. It’s always been a development game for them. So they’re just repeating their business model here,” he said. When I read that last November, I didn't think it necessarily applied to Atlantic Yards/Pacific Park, now 70% owned (outside of the Barclays Center and B2 modular apartment tower), by the Greenland Group, owned significantly by the Shanghai government. Dean Street closed next weekend for crane removal; arena loading dock accessed from Sixth Ave.
Sidewalks "will remain open only to residents and visitors of that block," which is pretty much everybody. 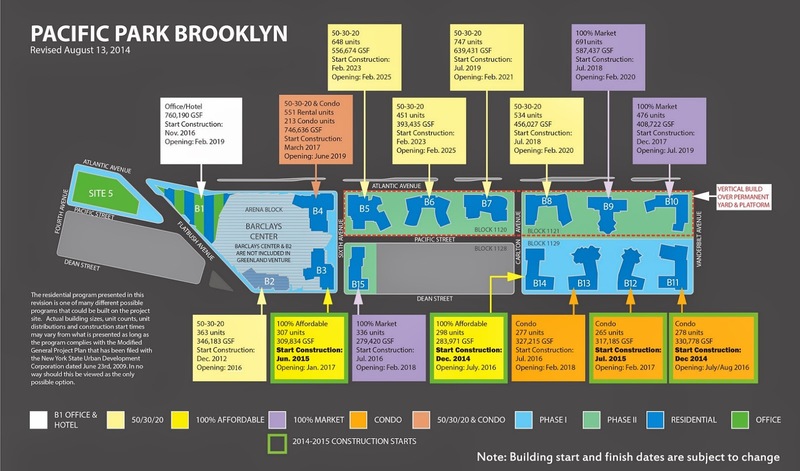 Notably, the B65 bus will be rerouted to St Marks Avenue and Carlton Avenue and vehicles needing access to the Barclays Center loading dock will go down Sixth Avenue, and turn right (normally against traffic on this typically one-way street), directed by flagmen. Do I have any specific suspicions regarding the ethics of Greenland Group, the Shanghai-based (and government-owned) parent of Greenland USA, the 70% majority owner of Atlantic Yards/Pacific Park (except the B2 modular tower, owned fully by partner Forest City Ratner, and the Barclays Center operating company, owned by Mikhail Prokhorov's Onexim)? Do I have any specific suspicions about the immigrant investors, mostly from China, who are supplying over $500 million in low-cost capital under the EB-5 program, and gaining visas for themselves and their families? Do I have any specific suspicions about the expected fraction of Chinese investors buying condos in Atlantic Yards/Pacific Park? There are some interesting quotes from Forest City's CEO in the Real Deal's Downtown Brooklyn’s second act: Q&A, part I: Forest City's MaryAnne Gilmartin and RXR's Seth Pinsky offer their takes. So, why did residential outpace office development after the 2004 rezoning? The narrative regarding 461 Dean Street, aka B2, has changed from the delays that pushed the timetable back two years, major cost overruns, the buyout of an investment partner, the unusual early payback of a tax-exempt loan, the winding down of the modular factory that was once supposed to build the entire project, and the legal battles that persist between developer Forest City Ratner (FCR) and its former construction and module fabrication partner, Skanska. But a mystery persists about just how well Forest City--and its New York State overseers--responded to problems at the building, notably the testing for possible mold, which can cause upper respiratory tract health problems. Not in the latest Atlantic Yards/Pacific Park Construction Update was what happened during the first day of the two weeks covered, which was a line-up of idling trucks in the neighborhood starting by 5:30 am (well before the official 7 am start of construction). It was caused by the early arrival of such trucks and a blocked exit path from the piece of Pacific Street that's private and used as a staging area. According to the latest two-week Atlantic Yards/Pacific Park Construction Update, covering the two weeks beginning yesterday and released yesterday by Empire State Development at 4:03 pm (late) after preparation by Greenland Forest City Partners, there will be a lot of late shift, Saturday, and overnight work. Notably, overnight sewer installation should occur at the intersection of Flatbush & Dean Street for the B2 modular tower, aka 461 Dean Street. A community notice will be distributed before the specified times. The Tower Crane for B2 may be dismantled during over the weekend of June 3. Demolition at Block 1120--the buildings on Atlantic Avenue below the railyard, between Sixth and Carlton avenues--may begin, with new fencing (aka MPT) installed and new equipment installed. There have been a couple of well-attended Bad Boy Family Reunion Concerts the past two nights at the Barclays Center. And, accordingly, Pacific Street just east of the arena--constrained by construction fencing, with two-way traffic, and having one garage open to the public--has been a madhouse during the early hours of the event. The two videos below were shot between 8:30 and 9 pm. As Wayne Bailey's title on the videos suggests, the city Department of Transportation might well consider adjusting the traffic pattern, such as restoring the street to one-way service. There are a couple of intriguing quotes in How Forest City Decided to Become a REIT, a 2/3/16 National Real Estate Investor interview with David LaRue, CEO of Forest City Enterprises, now Forest City Realty Trust (which now prefers to be called Forest City). Forest City, he said, sought "a sustainable capital structure that translated into reducing our leverage and increasing the cash flow from the business," meaning less debt and more revenue. But they didn't join the rush to REITs initially. Beyond the security issues raised at the 5/17/16 meeting (video) of the Atlantic Yards Community Development Commission, several issues regarding the state’s oversight of project community impacts were raised. Notably, it was disclosed that, despite a generally good record of compliance with the Memorandum of Environmental Commitments (MEC) aimed to avoid neighborhood impacts, a state monitor has recommended new tactics to limit idling trucks and other neighborhood impacts. Still, the developer does not seem to be at risk for penalties from Empire State Development (ESD), the state authority overseeing/shepherding the project. New York, NY – May 18, 2016 – PIX11 is pleased to announce it has partnered with DiBella Entertainment, one of the top boxing promotional companies in the world based in New York, and Barclays Center, Brooklyn’s landmark sports and entertainment arena, to broadcast “Broadway Boxing: Presented by BROOKLYN BOXING,” a 90-minute special airing on Saturday, May 21. Sponsored by BROOKLYN BOXING, Nissan of Queens, Optyx, and Azad Watches, “Broadway Boxing” will air directly following the PIX11 broadcast of the New York Mets’ home game against the Milwaukee Brewers, which starts at 4:10 p.m ET. City Hall described the ['agent of the city'] designation amid mounting scrutiny over its shielding of communications between the mayor and Jonathan Rosen, whom the counsel to the mayor described at a news conference on Wednesday as an “agent of the city.” Mr. Rosen, who corresponds and meets with the mayor regularly, is also a principal at a public affairs consulting firm, BerlinRosen, whose clients include real estate developers and nonprofits. ...The notion of designating a special class of unpaid advisers — many of whom also represent clients with business before the city — appeared to be an unusual, if not novel, approach to city governance, former officials said. City Hall, however, was careful to clarify that “agent of the city” is not an official designation. A resident asked me what was going on at the arena last Sunday, since the event was not listed on the Barclays Center event calendar for ticketed events. According to the Brooklyn Eagle, an annual Falun Gong conference was "expected to bring upwards of 9,000 practitioners from around the world to Barclays Center." The May event calendar for the community, belatedly released Tuesday night, simply mentioned a "private event," without details. The review at Radio.com described the show 5/17/16 of The 1975 as a lively arena rock spectacle, with "kids forming their loyal ocean at the foot of the stage, stomping frantically onto the floorboards and snapping giddy photos in the smoke machine-created haze." Thing is, the General Admission line, as shown in the video below, took over the Atlantic Avenue sidewalk snaking east to Sixth Avenue hours earlier, past the site for the B4 tower, narrowing access for neighbors. Can't blame the kids for wanting to get a good look, but consider: whether a residential building, as long planned, or an office building, as now planned, is built, such arena policies create even more of a conflict. This Friday and Saturday night, the Bad Boy Family Reunion hip-hop shows, from approximately 8 pm to midnight should draw 14,000 people to the Barclays Center and could cause significant local disruption. Because of "External Production Activity" on Dean Street and Atlantic Avenue between Flatbush and Sixth Avenues, there will be "a significant police presence," including unspecified "security and crowd control measures." A "significant number of vehicles servicing guests, talent and event staff" is projected. There will be "full deployments of Barclays Center Guest Relations, Pedestrian Traffic Managers and NYPD Traffic Enforcement Agents (TEAs) outside the building to assist with traffic and general event management." We'll see how many violators get fined. At the March meeting of the Atlantic Yards Community Development Corporation (AY CDC), the state entity set up to advise Empire State Development (ESD), a rather shocking account of sexual harassment and assault was diminished, in the ESD’s report, to a single incident involving one worker. That led resident Elicia Howard to go public in the New York Daily News and at a subsequent Atlantic Yards/Pacific Park Community Update meeting. Yesterday, at the subsequent AY CDC meeting, Howard came to tell the board directly. Her story was part of a larger, not-quite-resolved discussion about security improvements at the site and the Barclays Center. Notably, a new directive to arenagoers, developed for hockey games, regarding respect for the surrounding neighborhood is only now being added for other arena events.